Fourier analysis is a ubiquitous tool that has found application to diverse areas of physics and engineering. Goodman focuses on applications in optics, and in particular with applications to diffraction, imaging, optical information processing, holography, and optical communications. 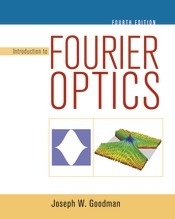 Goodman, Introduction to Fourier Optics satisfies the needs of several different types of Physics and Engineering courses. Directed towards both physicists and engineers this text is suitable for audiences focusing on applications of optics. A clear presentation makes this text work well as both a teaching resource and a reference book.